The apartment is 100m2 and consists of 3 rooms, two of which have double beds and one with separate beds. The apartment consists of a kitchen with a dining room on the ground floor and a living room on the first floor. The kitchen contains an oven, fridge, stove, microwave and coffee machine. There are also two larger bathrooms with a shower and one smaller bathroom with a shower, and there is a washing machine. Free WIFI and SAT TV. Air conditioning included. Pets (5 €). Common shared pool 8x4,5m., billard hall, table football, children's playground, wine tavern. Breakfast avaiable on extra charge and acordance on spot. The owner offers his own seasonal ecological fruits and vegetables as well as wine and olive oil from his own production. The leafy little town of Svetvincenat is the charming location for this most impressive house, perfectly matched to its delightful environs. Within a 10 minute walk you will find a couple of bars, a pizzeria, two general stores, post office and a pharmacy as well as the jewel in Svetvinenat’s crown, the main square. Home to a beautiful Renaissance church and an 18th Century loggia the square is dominated by the imposing Palazzo Grimani, a well preserved, medieval castle with a wide, lawned keep, fringed by chestnuts and pines. 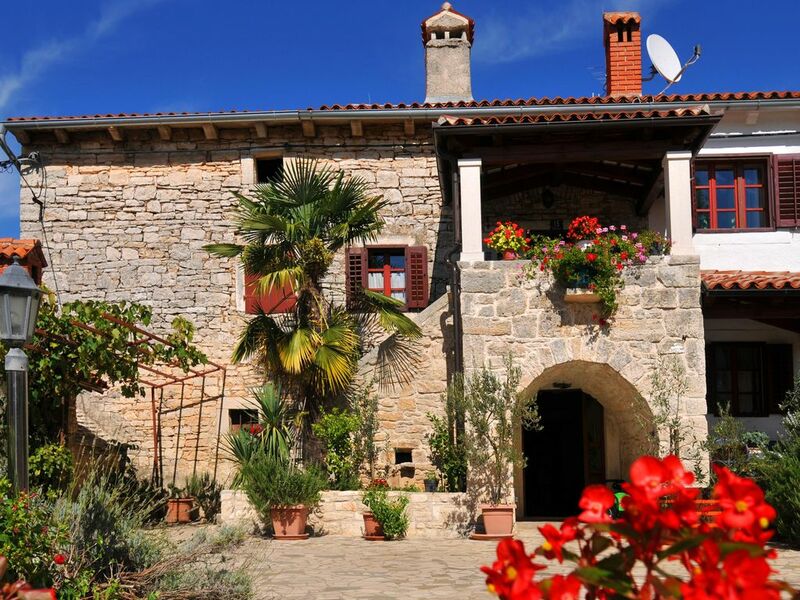 Situated in central Istria, Svetvinenat could not be more conveniently located. The principal towns of the region, including Pula, Rovinj and Pore are all within a 30 minute drive, as are the pebble beaches of the Adriatic coast. For a fascinating day trip take the boat over to the historic and beautiful Brijuni Islands National Park where numerous herds of fallow deer and peacock wander in parkland of cedar, laurel and bamboo. Closer to home, Svetvinenat has a varied program of cultural events to enjoy over the summer months including the ethnic jazz festival (start of July), the International Festival of Dance and non-Verbal Theatre (end of July) and, in mid-June, the election of the most beautiful goat in Istria.